Autism is a behavior and communication disorder that is comprised of autism, Asperger’s Syndrome and Pervasive Development Disorder-Not Otherwise Specified (PDD-NOS). All three of these share the autism signs and symptoms of difficulty communicating both verbally and non-verbally, difficulty relating to others and the world in general and difficulty being flexible in thinking and action. The main difference between these three is the degree with which the trouble is evident. At one end of this spectrum, a person may have severe symptoms, while at the other end the symptoms may be difficult to notice. As you read the various symptoms below, it is necessary to keep in mind that autism is so widely varied that each person will show a different combination of the traits, but not necessarily all of them. On the other hand, a person having a few of the symptoms may not have autism at all. These are meant as guidelines which can illuminate some of the challenges you may be having with your child and whether or not you may need further treatment from a professional. Let’s take a look at how the various symptoms play out in different life stages. Autism signs and symptoms in this young group may be difficult to see, but addressing the issue early can help give your child the best chance of success. One of the biggest signs is a young child who does not speak by the age of two or a child who starts to talk and then seems to regress to a pre-vocal stage. These children will have difficulty making eye contact with others. They will rarely, if ever, initiate play with others and will appear to not hear when you talk to them. Unlike other babies and small children, these children do not want you to touch and cuddle them. They do not return smiles and are unlikely to respond to play such as patty-cake, which requires mirroring another’s action. This is the period when autism signs and symptoms are most noticeable. Children on the spectrum won’t participate in pretend play. These children never seem to learn to understand nuances like sarcasm or irony because they not only think in imagery, but also take everything literally. For example, when an autistic child who is spinning in circles, (a repetitive action they may use to self-soothe), is told to unwind, they may literally start spinning in the opposite direction. Other self-soothing activities may be continuous rocking, spending hours watching things like a fan spinning or hand-flapping. During this period, the rigid personality, which is characteristic in all forms of autism, shows up. These children will often fall apart if schedules are changed or a different route is taken on the way to school. They prefer their belongings in a certain order and will notice if something is moved. They may play beside other children, but rarely join in a group. They may have an unusual attachment to something inanimate, such as a stuffed toy or blanket. Eye contact is still avoided as well as touch. Often this is because their senses seem to be amplified and they become more easily overwhelmed when there is noise or bright colors and lights. Your child may become interested in one subject and not want to talk about anything else. By this age, your child may have learned that it is considered rude not to make eye contact and has made adjustments but sometimes may go to the extreme of staring. Often, the autism signs and symptoms of rigid behavior and social isolation are more noticeable during these later years. Not knowing how to read social cues makes it hard to find friendships and, by the teen years and adulthood, many with autism have stopped trying. Your child may be shy, but sometimes the wish for friendship causes the exact opposite behavior and he/she can become overly friendly. The latter person may talk extremely loud and stand too close to others, and not understand why the other person is uncomfortable. t The one-track mind is still present andrules are considered almost sacred. If rules are broken he/she has no problem letting others know. Rigid adherence to routine has become even more ingrained and annoyance or even anger at unexpected change may occur. The understanding of office politics totally escapes the adult with autism and may prevent him/her from advancing in their careers. Many times it is not until an individual reaches adulthood that they learn they are on the autism spectrum (most typically occurs with individuals who are high functioning or have aspergers) . The diagnosis finally gives spouses, significant others and employers awareness and a rationale for some of the atypical behaviors they may have encountered and how to communicate with the individual more effectively. If you suspect that your loved one displays many of the above symptoms, there are many resources out there to assist you. The first step you should take is to have your child assessed to determine if they do meet the criteria for a developmental disability such as autism. Once a austism diagnosis is obtained you should apply for services from your closest Regional Center office. 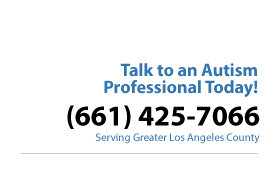 IOn addition, organizatons such as Autism Speaks and Autism Society of Los Angeles offer news, local events and valuable informational resources to support families dealing with the challenges of autism. It is proven that early intervention is critical for achieving maximum potential but it is never too late. Since 1 in 88 children today are diagnosed on the autism spectrum, it is prudent to keep in mind the signs and symptoms outlined above. It is also important to know that Applied Behavior Analysis (ABA) therapy has helped thousands gain the skills necessary for living fulfilling and independent lives. ABA is the only scientifically-proven method for successfully treating individuals with autism.